This post is sponsored by Cost Plus World Market. All opinions are my own. For more information, see my disclosure here. 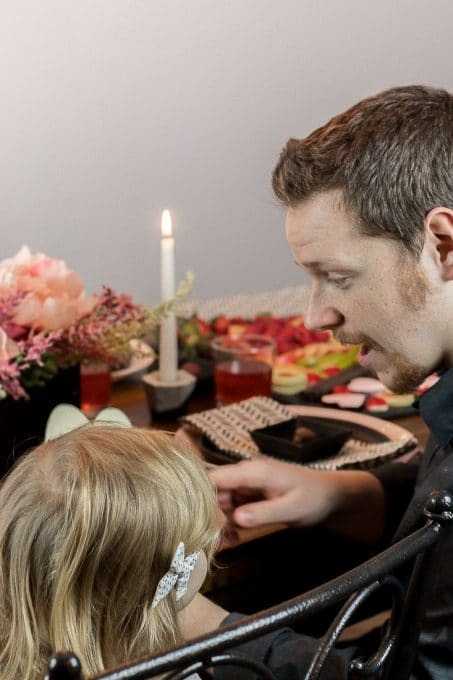 This Valentine’s daddy and daughter dinner tradition is so cute to celebrate at home with the family! 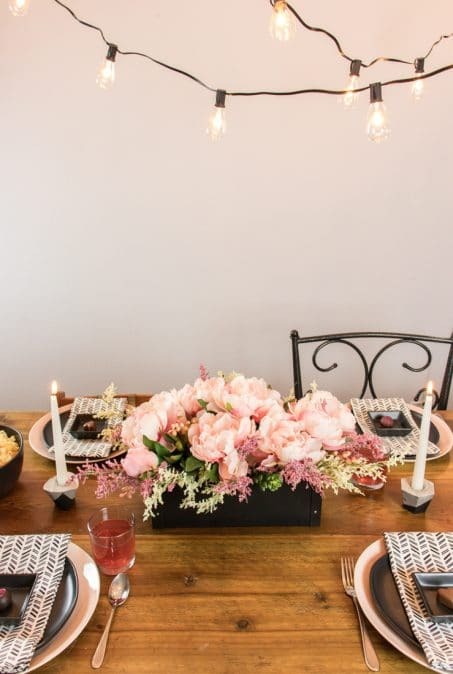 Growing up in a family of three girls, my dad had a fun tradition to throw a special candlelit Valentine’s dinner party each year. My dad would tell us we were his special Valentine’s and make a fancy dinner consisting of lots of chocolate. My mom was around to help with dinner, but it was always my dad’s thing and I have such special memories from that fun tradition. Now, that we have two little girls this is the perfect year for my husband to carry-on this tradition. We did it a little early so I could share with you some of the details in case you want to do it too. I went to my local Tigard Cost Plus World Market and was able to get everything we would need to throw the perfect Valentine’s dinner. I’ve linked everything that I got at the bottom of this post to make it easy for you. 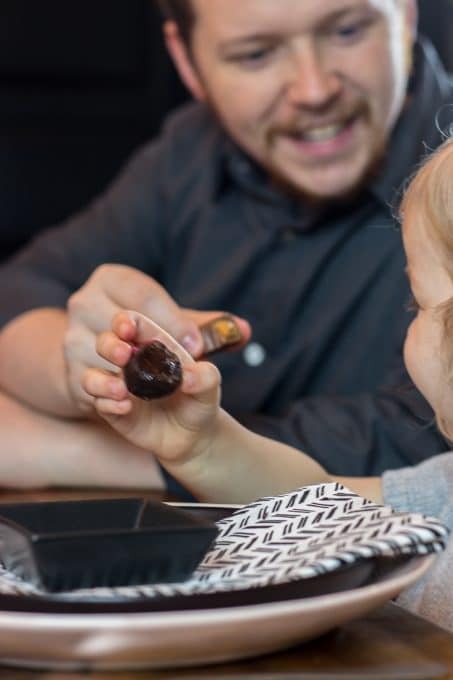 First off, you have to remember Mini Me is only 3 and Little Miss is 14 months so by dinner I mean “dinner” of things I knew my kids would love. Got to do what works, right? 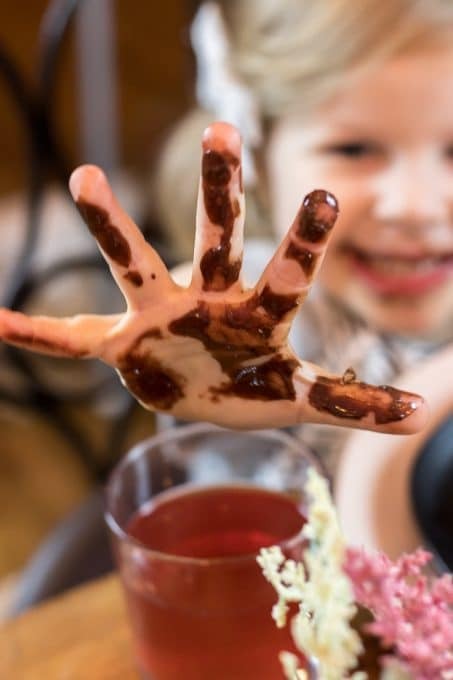 We eat pretty healthy dinners usually so treating them to a little chocolate every so often is totally acceptable and I don’t feel guilty one bit. 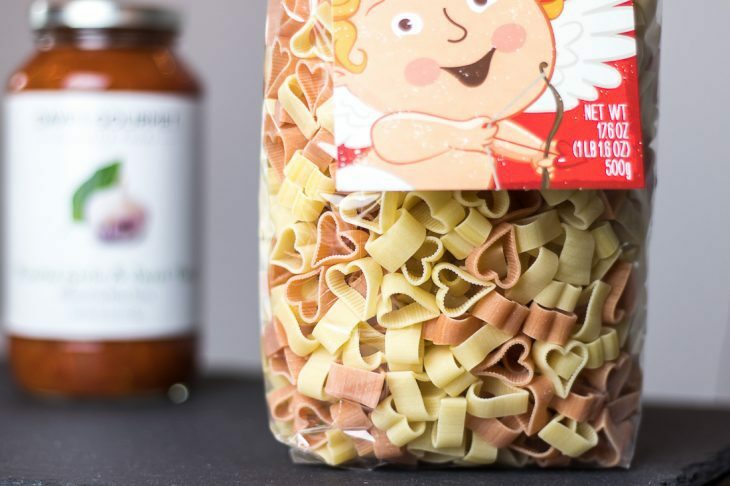 These heart shaped pasta noodles were perfect and Mini Me loved them!! Dumped in some tomato basil sauce from a jar after the noodles were done cooking and voila! Salad and bread would also be very normal to serve with this meal, however, I would have been the only one eating the salad and my husband has allergies and finding decent bread is tough. So, we do what works. 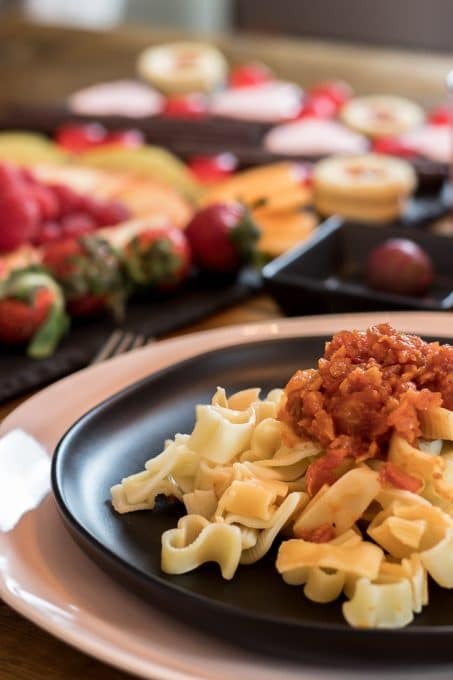 …Our own version of a fruit and dessert charcuterie board on this gorgeous slate cheese board from Cost Plus World Market to go with our pasta. 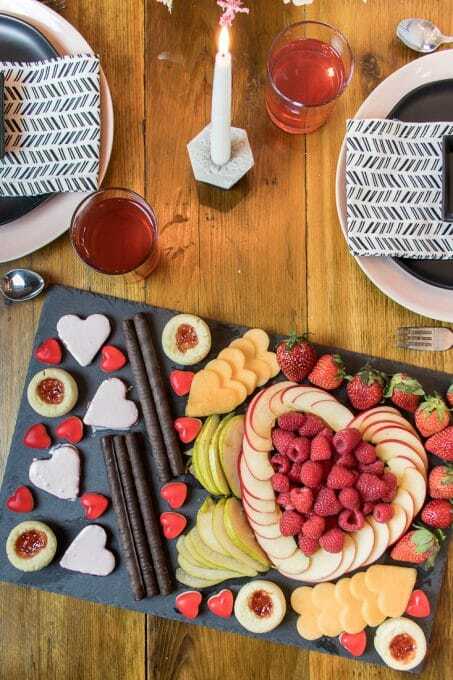 My girls would eat fruit all day every day if I let them so we arranged heart-shaped cantaloupe and other fruit on the board. These heart cookie cutters were perfect for cutting out the cantaloupe and the jello jigglers. For the jello, I just did a thin layer of strawberry jello in a 13×9 dish and then once that was set I mix a little bit of jello mix with cool whip and put it on top of the jello. Once that set again you just take your cookie cutter and make heart shaped jello bites. 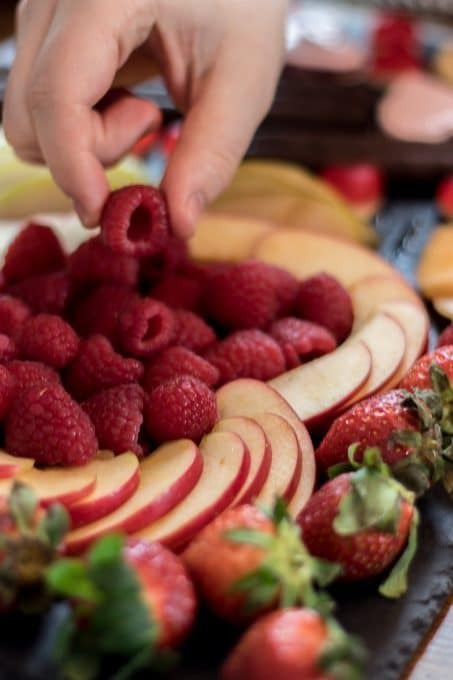 The fruit and dessert board turned out so cute and the girls loved it!! 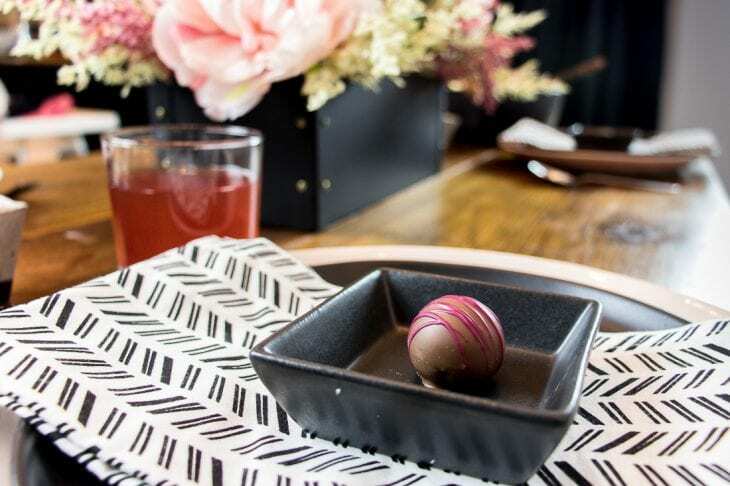 Each place setting included a stunning blush dinner plate with a Valentine’s chocolate placed inside a small black dish. 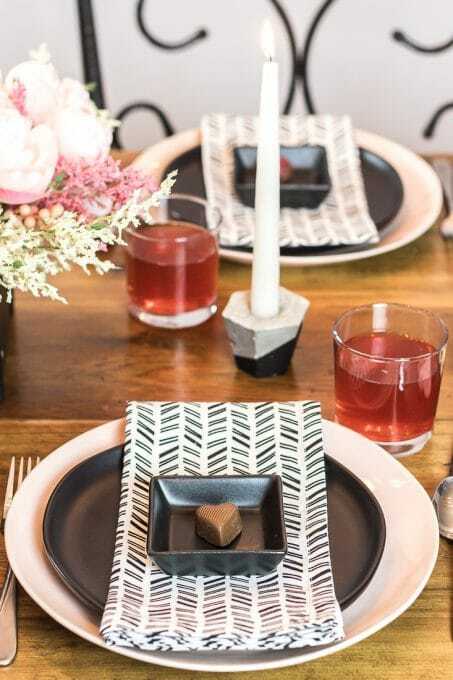 I’m obsessed with blush and black right now, so this was the perfect setup along with these black and white napkins. 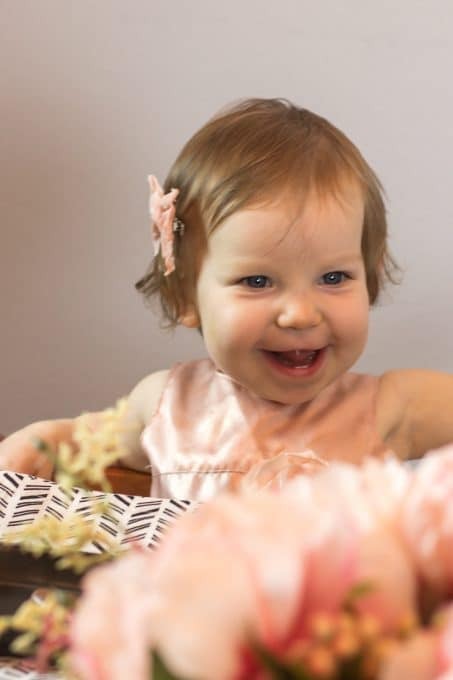 I am all over the blush décor bandwagon these days and Cost Plus World Market DID NOT disappoint. 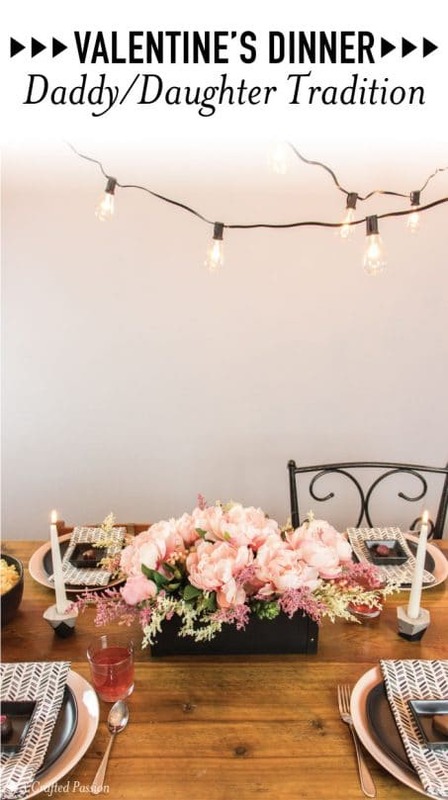 ALL the heart eyes for these blush plates!! 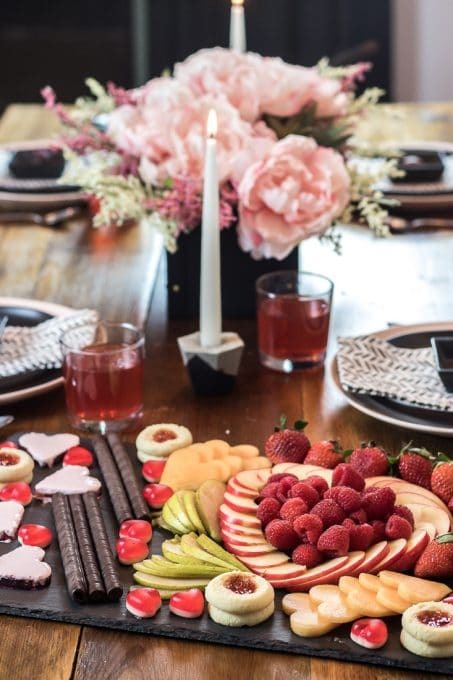 Of course what party is complete without Valentine’s Day candy? Justin and Mini Me have a special relationship and I love seeing them interact. It’ll be fun to see as Little Miss gets older how she forms a closer relationship with her daddy. As with all parties, I love being able to stick with a color scheme so I tried hard to incorporate all the pink and red to make a special night for daddy and his girls. 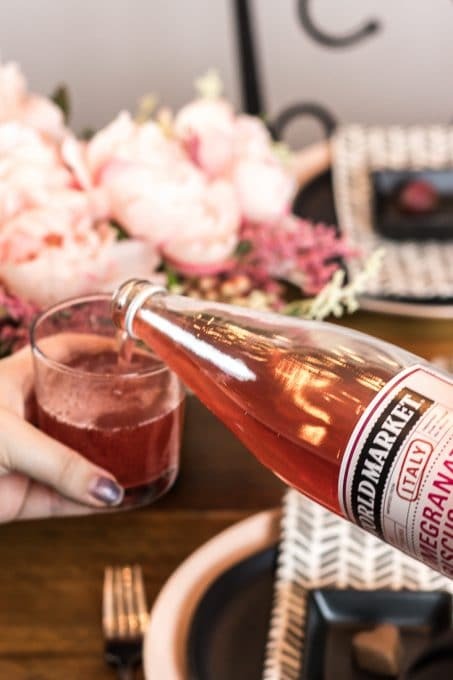 This pomegranate hibiscus soda is amazing and the perfect addition! 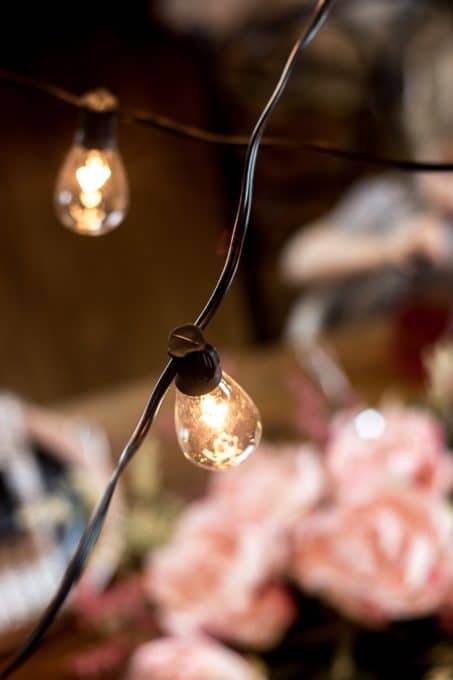 These Edison-style bulb string lights were the perfect touch to add a little more whimsy and make it extra special. We just used ceiling command hooks to hang them from the ceiling and they held up perfectly. 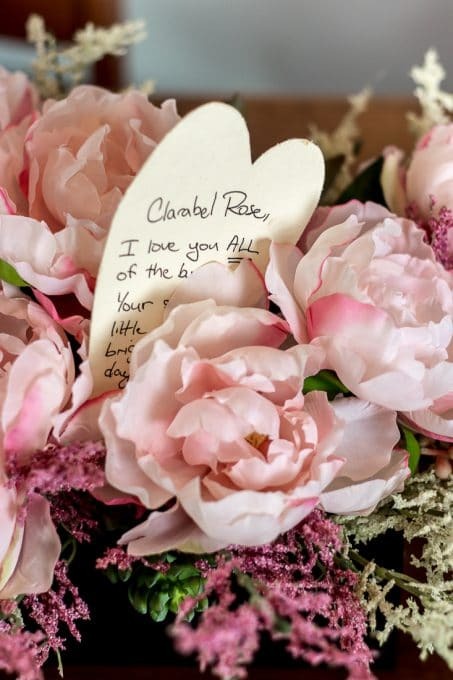 We’ve learned that Mini Me is quite the memory keeper so another thing that Justin did was write each of the girls a little note on a thick handmade heart card I grabbed from Cost Plus World Market. I know that she will cherish that for a long time. The girls are still little so gifts aren’t a huge priority yet, but if you need to find something great for the special someone in your life, Cost Plus World Market has tons of Valentine’s Day gift ideas for you. This daddy/daughter dinner turned out so cute and I can’t wait to help my husband carry-on this tradition for years to come! 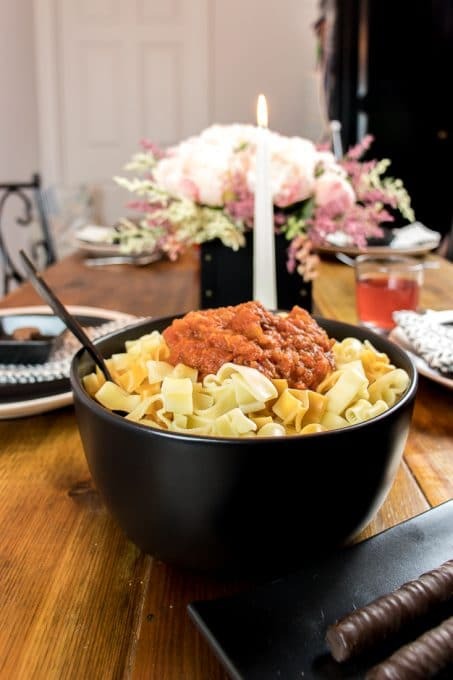 Grab what you need using the links below to get started planning your own daddy/daughter dinner. Such a fun tradition to start! My husband’s niece spends every Valentine’s Day with her grandfather. She’s in her 30’s now, it’s absolutely precious! This is so beautiful. My husband & I don’t usually do Valentine’s Day but after reading this I think it’s a tradition he will want to start with our daughter. Thank you for sharing.